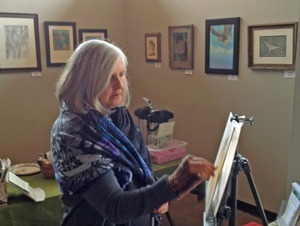 Linda Harrison-Parsons creates her works from what she sees in nature. She documents moments in time of those things that may be gone tomorrow. Born in Washington, D.C., Linda has traveled around the United States, Europe and Africa. Each new adventure opens up a new series of work featuring wildlife and nature. She was accepted into Maryland Institute, College of Art in Baltimore, MD and received a BFA. Continuing her education she received her MFA from, George Washington University, Washington, D.C. Creating a business during her studies at George Washington she worked with designers creating mural painting. Expanding her company she worked with businesses and in private residence, continuing to paint murals. Later she became a certified Artist in Resident through the Maryland State Arts Council, teaching all levels of students, throughout Maryland. Developing workshops for adults, alternative school programs and working with special needs students since 1994. Linda has been invited to teach workshops at Ghost Ranch and Taos, New Mexico, Wisconsin, Michigan, Florida, Maryland, Virginia, Arizona and Zambia. Linda continues to explore new venues each year for exhibiting her personal work in galleries, group and solo shows. She is an award winning artist whose work is inspired by the natural world. All of her work is based in the strength of drawing. Currently she works with handmade papers, mixing mediums of soft pastels, watercolor, ink or water-based oils to achieve the desired effect. She has works in businesses and private collections throughout North America, South America, Africa and Europe.